This bright, spacious 2 bed, 2 bath ground floor apartment is located in a secure, gated complex. It benefits from a lovely shared swimming pool and solarium, along with well maintained communal gardens. The property has a master bedroom with en-suite and king size bed and also a twin bedroom with a separate family bathroom. Kitchen has a hob, oven, fridge freezer, microwave, dishwasher and washing machine at your disposal. It comes fully equipped for dining in should you wish. However the famous Villamartin Plaza with over 30 bars and restaurants is just a 4 minute walk from your front door. You'll also find a Supermarket, Dentist and medical center should you need them. Hot and cold Air conditioning can be found in the lounge and master bedroom, along with English TV and free Wi-Fi, iron and ironing board and hair dryers. Bath, hand towels and even beach towels are supplied to ensure you have a pleasurable stay. Car hire is highly recommended for sight-seeing however there is a bus stop on the Plaza which stops at the beach and La Zenia boulevard, and also a taxi rank across the road from the apartment. Airport transfers can be arranged. There's plenty for all of the family to enjoy within a five minute drive including La Zenia Boulevard Shopping Center, play areas for children, local blue flag beaches, markets, bars and restaurants. Villamartin golf course is just 5 minutes walk from the property, with Campoamor, Las Rambles and many other fantastic courses within a 15 minute drive. €60 is payable on arrival for clean & laundry, this is for up to 4 people and an extra €5 thereafter. A €10 surcharge applies for departures and arrivals outside of 8.00am - 8.00pm. And a surcharge of €25 will apply for arrivals after 10.00pm. Was very cluttered. Overall rating 8 out of 10. Perfect for our stay. The apartment was immaculately clean, well maintained and had all the facilities needed for a great stay. Ideally located (two minutes from the plaza) yet extremely quiet. Excellent value for money compared to some of the other places we have stayed in. Highly recommended and will definitely be booking again. Thank you so much for taking the time to write a review on our property, we are so glad you enjoyed your stay and look forward to seeing you again in the future. Thank you for taking the time to write a review on our property, I agree that if you would like to take trips or go to the beach a lot a car is a benefit and we do recommend this in our listing. The table on the balcony is set up for 4 people and is meant for your enjoyment to dine outside only, I will take you comments on board. Thank you for taking the time to write a review, I am so glad you enjoyed your holiday and hope to see you again in the future. 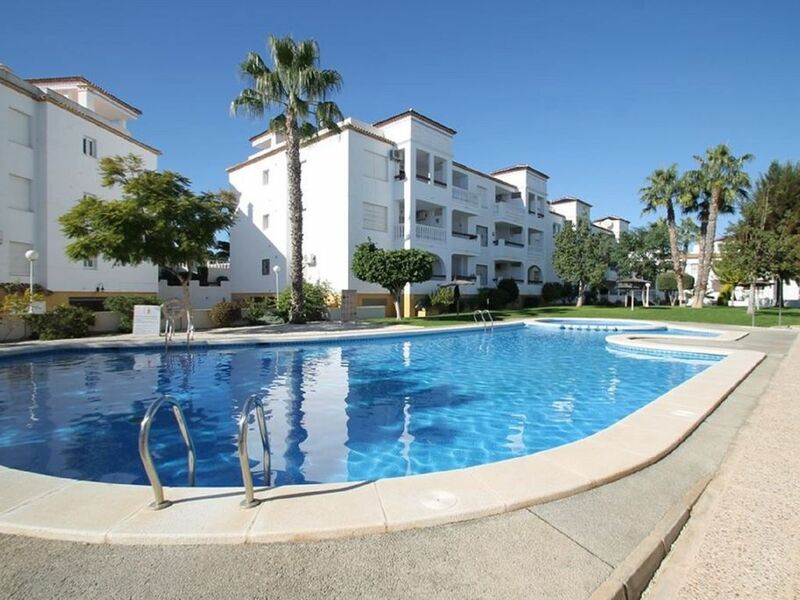 A great apartment in Villamartin, close to the shops and bars / restaurants but far enough away not to hear any noise . Within 15 min drive to great beaches , Restuarants/Bars..
Really nice property and great location. Great location, 3/4 minute walk to the plaza. Well looked after. Nice pool area. Very clean. Would stay again 100%. Thank you for taking the time to write a review, we are so glad you enjoyed your holiday and that the property had everything you needed. We look forward to seeing you again in the future. €60 will be collected on arrival for clean & laundry Departures prior to 10.00am and arrivals after 2.00pm unless other arrangements have been made.